You know what is so awesome about UL backpacking? The people. The people, who, driven by their desire to make something unique, more light, more perfect, create with much blood, sweat and tears a great product, with plenty of input from the UL community. Guys like Devin from the boilerworks, for example. Go read his blog and bookmark it. It's awesome. Locus Gear has a 1st Anniversary Sale going on, so now is a good time to get those fine shelters and bags. Titanium Goat, that elusive cottage manufacturer in Utah which doesn't want to be interviewed, has a bunch of new gear. The Yagi tenkara fly rod for trekking poles is awesome - you may buy me one! Nibe gives useful advice on how to pass your time and includes a Optimus Crux Lite Solo Cook set review in between! Fishing in Finland is an article I wrote for the Helsinki Times newspaper a while ago, go have a read if you have a passion for angling! Coiling ropes - with a twist is a great video for the folks among us who carry ropes in the wilderness and need a quick and easy way to coil their ropes. This week also saw another cottage manufacturer interview, this time with Eric Parsons from Revelate Designs. Bikepacking your thing? Definitely check this one out then! The guest post on terrybnd's blog - Can Extreme Hikers Learn To Love Germany? - is a very nice read, and worth your time. Also news-worthy this week is that both Phil and Martin joined Joe and me as Gossamer Gear Trail Ambassadors. Andy Kirkpatrick tells the truth about breathable waterproofs. Goof-off Tuesday started this week, and economies the world over collapsed within minutes of me publishing this disruptive article as people stopped working and thought about what they'd rather do, like Dave from Bedrock & Paradox and Tookie's A paddle and a walk. Eric would like to know how to fix his puukko knife - can you help him? 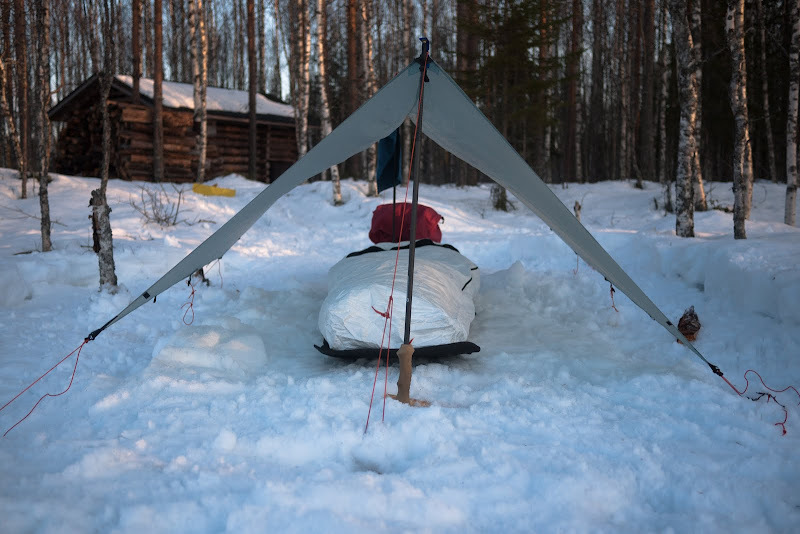 The MYOG community will fancy a read of Michael Krabach's My Cheap Snow Camping Sled. With all that festive stuff going on, we should remember those who aren't as fortunate as we. Beads of Courage is a recommended read and reminder to cherish what you have while thinking how you can help others. Same goes for James' Photo Voices article, which you also should check out. Basti and his wife finally finished their MYOG Down Duo quilt. Looking for a project to do over the cold days? This could be it. Jason does a Solid Fuel Burn Time Test, and pitches the likes of WetFire, Trioxane and Esbit against each other. Phil went to the coast to shot some photos for the Mountain Hardwear Hooded Compressor PL Jacket and I am sure that the photos now also are used as the desktop background of female UL hikers the world around. Mike shows us how to make a Bushcraft Winter Kitchen. Great stuff. Joe talks about the Kupilka kuksa and alternative drinking strategies, lovely photos and great writing! Mark shares his first impressions of his Laufbursche huckePACK with us. Richard shows off the Berghaus Pro Trek Shell Jacket. Maz showcases his First Aid kit and asks what you carry - go check it out, a good post! Philip is selecting a bivy for winter, read his great article on this top if it is of importance to you. Yours truly did a review of the Rab Demand Pull-On, an ultralight hardshell made from eVent. Roman goes to Kimberly Australia, down the King Edward River and into the Bungle Bungles, hunted by snakes, crocs and bulls, sleeping with scorpions, flown over by fruit bats, yes, Epic stuff. Recommended read and see! Maria enjoys a winter day in Nuuksio. Also Yeti reports more about winter! Mike Knipe met Martin Rye on Red Pike who met James Boulter on Mellbreak. In case you missed it, Sam reminds us that winter is here and went Splitboarding and Backcountry Skiing. Finally, forget Mini Bull Designs - this is the future of UL cooking (the video might not work everywhere due to copyrights! ).